Åre, Sweden is a one-of-a-kind ski town nestled between a mighty chunk of mountain, a mythical lake, an expanse of wilderness highlands and the broad Swedish sky. It is a worthy dream destination to add to your skiing and snowboarding bucket list, and we’ve got the full scoop. 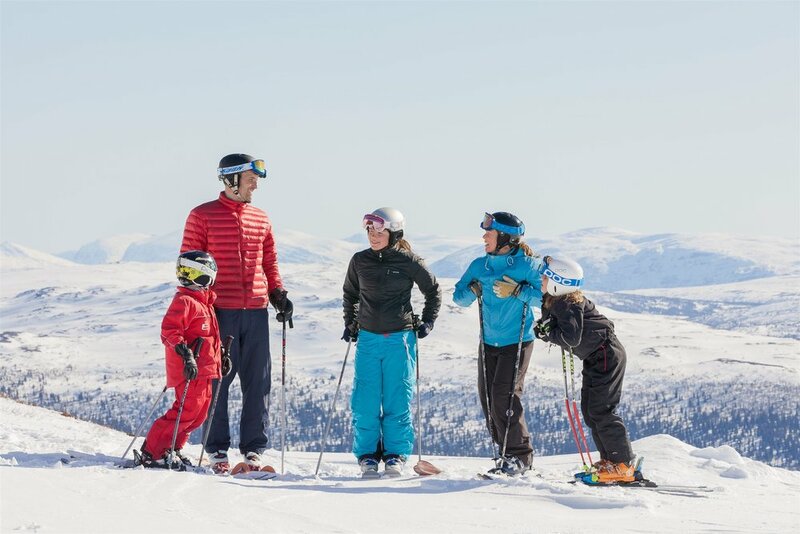 Located about 220 miles (350 km) south of the Arctic Circle in the Scandinavian Mountains (also known as the Scandes), Åre is distinctive and modern, with deep roots in history. Travelers started coming here in the 1800s for the fresh air. Downhill skiing took off in earnest in 1910 with the opening of the Bergbanan funicular in Åre’s town square, which ferried skiers and sightseers from Åre’s town square up the lower flank of Mount Åreskutan to an alpine plateau called Fjällgården. Today, the Bergbanan still runs—but now Scandinavia’s largest ski area fans out from the historic core. From the windswept and scenic summit of Mount Åreskutan, the slopes drop nearly 3,000 vertical feet (890 meters) to the colorful lakefront town below. Broad, well-groomed pistes offer a slice of heaven for intermediates and novices, as well as fun for experts into racer-style carving. Up high, two in-bounds alpine bowls deliver more diverse expert offerings – and the adjacent backcountry is abundant in excellent and challenging steep and deep terrain. Back in bounds, multiple terrain parks deliver action for jibbers of varying levels, and night skiing and riding are a regular affair. Åre is composed of four resort centers and three ski areas, but the main attraction is Åre By, (Central Åre). This is Scandinavia’s alpine heart, with a great culinary scene, a big array of both family-friendly and wellness activities, an ever-present zest for the outdoors – and pulsing nightlife. Peopled by Olympians, artists, X Gamers, mountain guides, master craftspeople, moose farmers, acclaimed chefs, rugged pioneers, ice driving experts, chocolatiers and modern mountain hipsters, Åre is innovative, welcoming and full of life. This is the place to step into a 1,000 year old church moments before riding a thoroughly modern cable car. Or to celebrate a winter wedding in a glittering party-cave sleekly carved under a frozen waterfall. To experience the culinary bounty of Sweden’s own Tuscany, rendered in char, cheeses, cloudberries and aquavit, then enchant your children with a herd of real reindeer. Or to savor coffee and fresh-baked Swedish treats with your mountain guide in a snow-crusted café atop Mount Åreskutan before skiing Scandinavia’s most extraordinary backcountry steeps. And most of all to have a very good Swedish time. Also awesome: A single-day, full-price, all-access adult lift ticket costs only €47.5 (currently just shy of $55 USD). As always, multi-day passes, lift/lodging packages and other deals bring the per-day lift price even lower. Info links below. 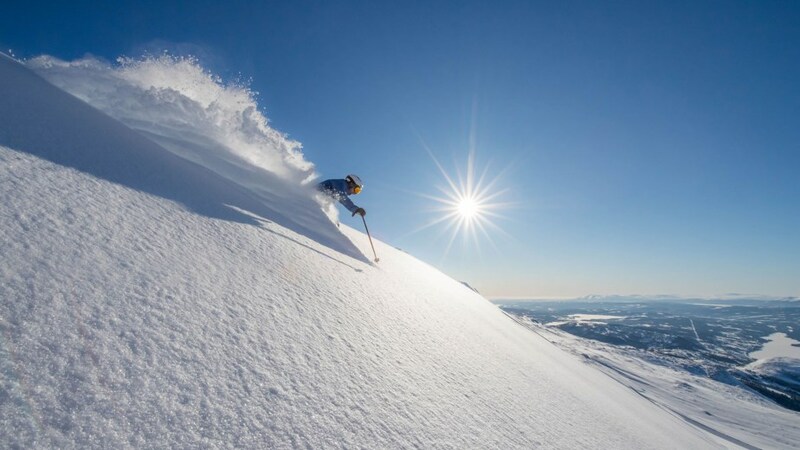 Åre may be remote but it is the 50th most visited mountain resort in the world, making it more popular on a global scale than well-known Colorado destinations like Steamboat and Beaver Creek. It is a great place for families. Åre is located about 386 miles (620 km) northeast of Stockholm. The nearest city to Åre is Trondheim, Norway, located about 100 miles (160 km) due east. The Trondheim airport (TRD) is served by several major airlines, including KLM and Norwegian Air International. There also is a local airport, Åre Östersund (ORD) which is served throughout ski season by EasyJet from London Gatwick, Bristol and Copenhagen, as well as by BRAflyg from Malmö. Public transportation in the Åre region is robust, therefore visitors who arrive by plane often take an airport transfer to their lodgings. Many guests also travel to Åre by train.